This is NOT your father's beach cottage! 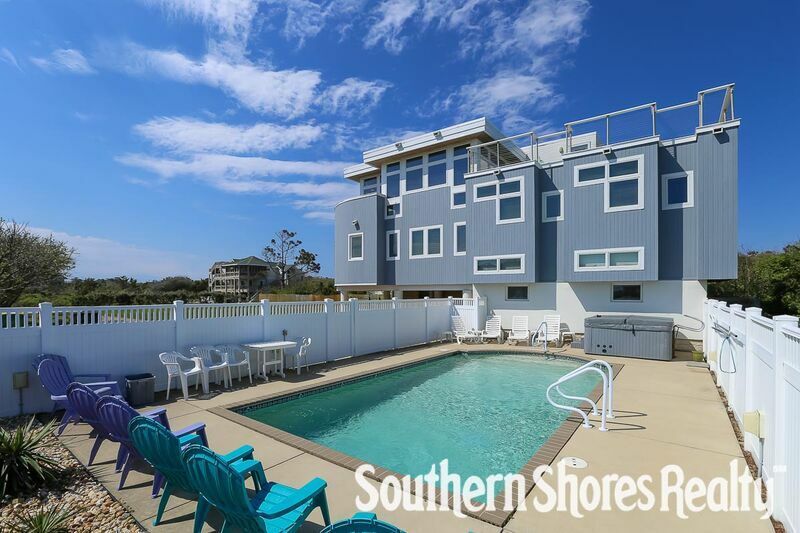 The stylish, modern design and layout of this beach house offers over 2,600 square feet of sophisticated living just 85 yards from the beach access. Enough space for large gatherings and secluded spaces to get away from it all, too. Enjoy panoramic ocean views from the upper deck and from the glass-walled great room. Huge 24' by 14' pool and large yard round out this architectural landmark. Improve your attitude at Latitude 36. 2 bedrooms (1 with King, 1 with Queen and Bunk set), full bath. Great room with 42" plasma home theater (CATV/DVD player/stereo), well-equipped kitchen with microwave, dishwasher, dining room, 2 bedrooms (2 with King), full bath. Great room and ocean view, 1/2 bath, wet bar with refrigerator, 42" plasma home theater (CATV/DVD player/stereo), foosball table, game nook, and private sundeck.